I am programer by trade and owner of a small software/webdesign firm. I am 41 now and riding since I was 13. Got in love with inline 4s with my last bike (Versys1000 2015). Usually riding two up with my wife around Europe and here localy. I had hoped to make it to Serbia on my XR this summer but it looks like I might only have time for Slovenia & Croatia. Uberserb, you'll both over when you settle into it, some great places for you to ride, whole of Europes best roads. And Jockser, good on you pal, not on my list as yet..
Last summer I met a group of biker from ireland just outside my city. They were looking for a hotel. I helped them after few hours of riding on local roads we have found a good hotel and we have a lunch and have a few drinks and all that. 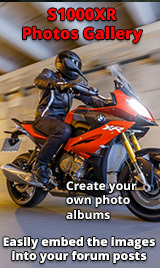 Basically you are missing a lot if you don't connect with local Serbian bikers to show you where the nice roads/foods/hotels are. If you are touring Balkans you can not miss my city since its on crossroads. And its very hard to tour Croatia and not come to Serbia. Croatia is shaped like boomerang so you will probably cross Serbian border somewhere or you will have to ride the same road on back trip. So if anyone coming this way feel free to drop me a message. Nice to meet you. BTW you are the reason why I have to wait my bike next few months :) I was reading your posts about non ESA and I decided to listen to your advice. Also I was little worried having non adjustable sus since I am 117kg and my wife 77kg. Maybe little too heavy for DESA standards. Anyway your posts convinces me not to take my dealers offer and I ordered non ESA. For the money I saved I bought other accessories like BMW alarm and such. The only problem is there was not a single one non esa bike available in entire European dealership network. So my bike is scheduled for production in April 20th. but I feel better knowing that I will have fully adjustable sus. If non esa works, I'll buy you a beer :). The whole BMW sales pitch is one of the great cons,they know the average buyer knows nothing about suspension and even better doesn't want to know so their sales are geared to a one way street unlike Ducati any noticed their latest Pikes Peak has real ajustable Ohlins on now. But I'd been this route with the k1200 that I still have,so I'd heard all the BS about no one wants non ESA and we have no demo blah blah blah only to find out it was a complete lie and because I believed that at the begining they had me running around in circles for months till I worked out what was going on. Fast forward to the XR same old BS from the same old BMW but by which time I knew the drill,so I demo an ESA model and tell them don't bother trying to sell me one, I fill the bike up with fuel ride for an hour take it back and chuck 20 quid on the table for the guy to buy himself a drink and off I go. Suddenly realise a custom order isn't so easy hand guards are extra in the mean time a secondhand one turns up virtually the same spec and phone within hours of the add appearing it's sold mate he says non ESA always does because they are so rare!!!! Thanks!!! Mine appears last March with the exception of my XT660 all my other bikes run either Ohlins or Wilbers the stock rear shock isn't great just like the ESA but has loads of ajustabilty but will do till I fit a Wilbers which will be a 630 they refuse to supply a 620. Most of the guys on here cone from GS's but this forum will go just the K variations the Alpha buyers will come and go but when these XR's have 20/25000 miles on them and folks have no ajustment for two up with luggage because the shock has started to wear they will be into a world of hassle and financial pain which I have avoided on my K because of it being non ESA takes 20 minutes to pull the shock if it ever needs servicing. Fronts forks take some breaking in just set them on a soft setting till they loosen up. Never say never ! If we do get there it'll be a last minute thing. The second week we're heading to Auschwitz & then, probably, back to Austria for the MotoGP. And the final week is likely to be a loop through Slovenia & Croatia.